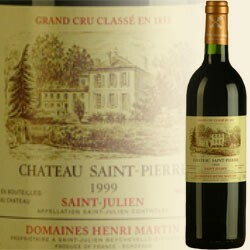 Produktinformationen "Chateau Saint Pierre 2006, 4e Cru Classe (Chateau Saint Pierre)"
Wine Advocate # 181 Feb 2009 Robert Parker 93 Drink: 2013 - 2030 A candidate for one of the finest St.-Juliens of the vintage, St.-Pierre’s 2006 is one of the smaller productions in this consistent appellation, making it difficult to find in the marketplace. Its deep opaque purple color is accompanied by notes of roasted herbs, charcoal, graphite, and extravagant creme de cassis and licorice. Full-bodied, powerful, deep, and rich with outstanding balance, purity, texture, and length, this stunning 2006 will be very long-lived. Anticipated maturity: 2013-2030. Weiterführende Links zu "Chateau Saint Pierre 2006, 4e Cru Classe (Chateau Saint Pierre)"
Unser Kommentar zu "Chateau Saint Pierre 2006, 4e Cru Classe (Chateau Saint Pierre)"